Same average test weight of 57.4 lb/bu (73.9 kg/hl) as 2016/2017, indicating overall good quality, with about 84% of the samples at or above the limit for U.S. No. 1 grade. Same average broken corn and foreign material (BCFM) (2.9%) as 2016/2017 and 5YA, slightly lower than the maximum limit for U.S. No. 2 grade (3.0%). BCFM predictably increased from 0.8% to 2.9%, as the crop moved from harvest through the market channel to export. Lower average total damage at export (1.9%) than 2016/2017 (2.7%) and 5YA (2.1%). The majority (98.1%) of the samples were below the limit for U.S. No. 2 grade. 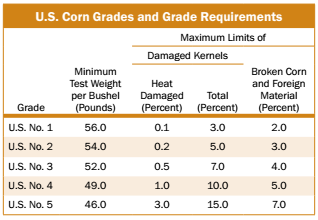 Average heat damage was 0.0%, the same as 2016/2017 and 5YA, indicating good management of drying and storage of corn throughout the market channel. Slightly higher average moisture (14.4%) than 2016/2017 (14.3%), but same as 5YA. 5YA represents the simple average of the previous five years of quality factor results from the 2012/2013, 2013/2014, 2014/2015, 2015/2016 and 2016/2017 Corn Export Cargo Quality Reports. Same average protein concentration (8.6% dry basis) as 2016/2017 and 5YA. Slightly lower average starch concentration (72.1% dry basis) than 2016/2017 (72.4%) and lower than 5YA (73.4%). Higher average oil concentration (4.1% dry basis) than 2016/2017 (4.0%) and 5YA (3.9%). Slightly higher average stress cracks (9%) than 2016/2017 (5%), but slightly lower than 5YA (10%). The majority of the export samples (84.0%) had less than 15% stress cracks, which should result in relatively low rates of breakage during handling, but may be higher than last year. Slightly higher average stress crack index (SCI) (22.4) than 2016/2017 (11.6), but slightly lower than 5YA (25.8). The higher SCI and stress crack percentages in 2017/2018 than in 2016/2017 may be due, in part, to higher average moisture at the 2017 harvest than at the 2016 harvest. Higher average 100-kernel weight (36.07 g) than 2016/2017 (35.26 g) and 5YA (35.37 g), indicating larger kernels in 2017/2018 than last year and 5YA. Higher average kernel volume (0.28 cm3) than 2016/2017 (0.27 cm3) and 5YA (0.27 cm3). Slightly higher average true density (1.287 g/cm3) than 2016/2017 (1.285 g/cm3), yet similar to 5YA (1.288 g/cm3). Lower average percent of whole kernels (84.4%) than 2016/2017 (88.2%) and 5YA (88.9%). Average horneous (hard) endosperm of 81%, higher than 2016/2017 (79%), but slightly lower than 5YA (82%), indicating slightly harder corn in 2017/2018 than in 2016/2017. All of the export samples tested below the U.S. Federal Drug Administration (FDA) action level of 20 ppb for aflatoxins. A higher proportion of the export samples had no detectable levels of aflatoxins than in 2016/2017. 100% of the corn export samples tested below the 5 ppm FDA advisory level for deoxynivalenol (DON) or vomitoxin (same as 2016/2017). There were fewer samples showing levels of DON above the FGIS “Lower Conformance Level” of 0.5 ppm in 2017/2018 than in 2016/2017.